This is the color printer series we use in our office at PrinterTechs! 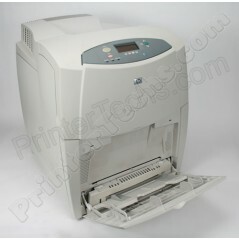 The HP Color LaserJet 4650dn is a large color printer, good for workgroup use. The 4650dn includes a duplexer for double-sided printing, a JetDirect card for connecting the printer to a network, a 500-sheet cassette paper tray, plus a manual feed tray. We rebuild the fuser, transfer kit, and install high quality rollers and separation pads. The parts our technicians approve for install are more expensive but you get improved performance compared to cheap aftermarket parts. Compared to HP's latest line of color LaserJets, a refurbished 4650dn can save you a bundle in printing costs! Also, compare our toner cost with HP's pricing -- you'll be surprised at the savings!